Sit anywhere Uni-Q sound At the heart of the evolved Q Series is the Uni-Q driver array. The signature innovation places the tweeter in the acoustic centre of the midrange and bass cone, bringing the acoustic ideal of a single point source closer than ever to realisation. The result is a more detailed, accurate three-dimensional sound image, which is dispersed more evenly throughout the room than is possible with any conventional speaker. Uni-Qs ultra-wide dispersion is further enhanced through KEFs tangerine waveguide over the tweeter dome. Damped tweeter loading tube With the addition of the damped tweeter loading tube providing a gentle termination of sound produced from the back of the tweeter, lower treble performance is improved dramatically and a new low-distortion inductor on the crossover provides cleaner bass. New system design The closed box midrange cabinet design reduces the load on the Uni-Q midrange cone, increasing clarity and detail while delivering cleaner, punchier bass. Midrange clarity is enhanced again through improvements to the mid-bass driver that allowed the DC blocking capacitor to be eliminated. Its removal also created a more natural bass roll-off between the drivers. Beefier LF drivers and ABRs Low-frequency (LF) drivers now have a larger roll surround, along with a new suspension to produce cleaner bass at high volumes. A new cone structure improves midrange clarity, and an enhanced Auxiliary Bass Radiator (ABR) with a new surround and rear suspension delivers better controlled and more impressive bass. 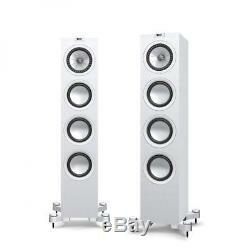 The item "KEF Q550 Floorstanding Speakers White Pair EX-DEMO" is in sale since Sunday, October 7, 2018. This item is in the category "Sound & Vision\Home Audio & HiFi Separates\Speakers & Subwoofers". The seller is "premium-sound-uk" and is located in London. This item can be shipped worldwide.